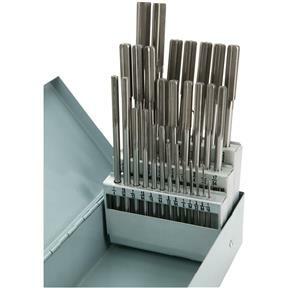 This is a nicely made fractional High Speed Steel Chucking Reamer Set. Precision ground to close tolerances, they come with laser etched size markings. 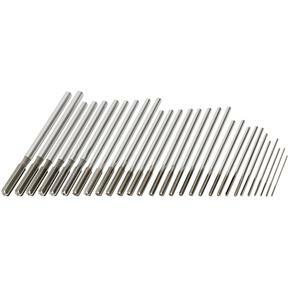 Sizes range from 1/16" to 1/2" by 64ths. Supplied with an indexed box. Very affordable precision. 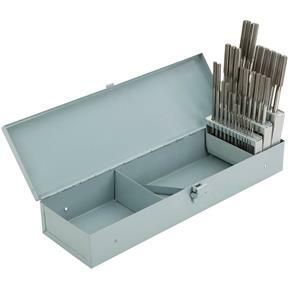 The reamer set came in a metal box that was all but destroyed in the shipment due to poor packing, then rough handling by the carrier. Several of the reamers fell out of the metal box and were loose in the cardboard box. I reported this to customer service. I also sent pictures. They said they could not send just a metal box to replace the damaged one. I needed the reamers for several jobs and could not send the whole package back. So I ended up with the reamers with no metal box to hold them. They gave me a $25.00 dollar gift certificate.